Katherine Lopez is the Head of Communication. She received the IITA Excellence Award as Outstanding Support Staff for 2010 and the Outstanding Publication for 2011 for R4D Review, IITA’s flagship publication, which she edits. Before joining IITA, she was Science Editor and Assistant Manager for Product Development at the International Rice Research Institute, where for 6 years she edited the International Rice Research Notes, a semiannual, semitechnical publication series and provided leadership in managing major communication projects and developing new communication products. 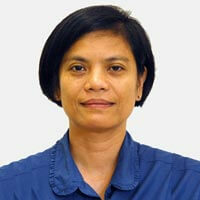 She also served as Assistant Editor and head of the Office of Information Services at The World Vegetable Center (AVRDC) in Taiwan; information officer and head of the Technical Services Division, Forest Products Research and Development Institute; and Editorial Assistant; Southeast Asian Regional Center for Graduate Study and Research in Agriculture (SEAMEO-SEARCA) based in Los Baños, Laguna, Philippines. She holds BS and MS degrees in development communication major in journalism from the University of the Philippines Los Baños (UPLB).